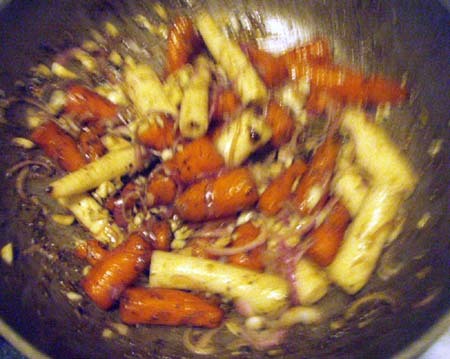 In French cooking, the combination of carrots and onions on the menu is often called 'a la Nivernaise'. It's a stand-alone veggie dish that can be made with turnips. 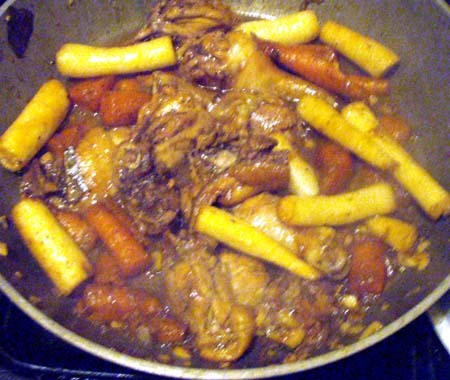 Aklay kicks it up a notch by making the carrots glacé and adding chicken to make it a meal on its own. Brush carrots and radish to clean. Trim the ends. 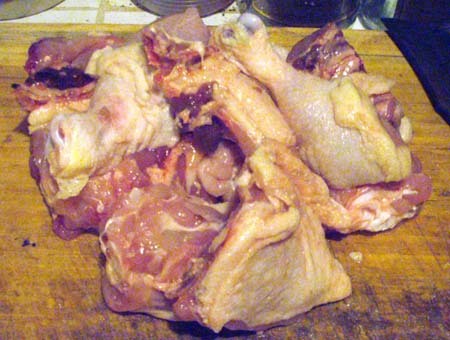 Cut up chicken into serving size. Chop onions, garlic. 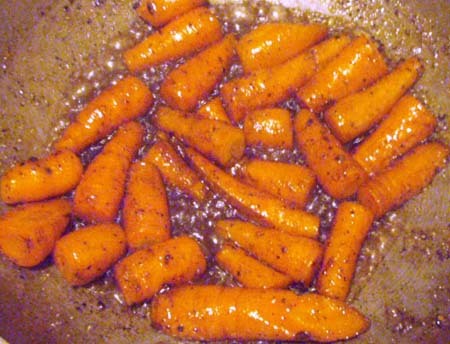 In a frying pan, put carrots and add cold water until carrots are covered. Add honey, butter, bay leaf, salt and pepper and turn the heat to high until it boils, leaving pan uncovered (to facilitate reduction). Lower heat and continue simmering until water evaporates. 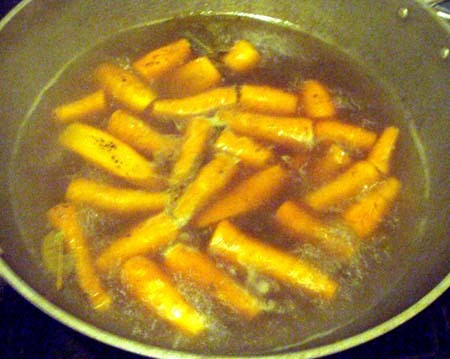 The carrots should have a glazed coat at this point. Turn the heat up, add the radish, onions and garlic, and toss around for about 2 mins to coat. Place chicken pieces on top, sprinkle salt and pepper, and cover. Keep the heat high for another 3 minutes, then lower down heat and cook for 22 minutes (chicken needs 25 mins cooking time altogether), shaking the pan from time to time, to keep it from burning. That's it. Even with the addition of the honey, the carrots didn't come out sweet at all. I'm surprised that even without adding water when the chicken was already added, it didn't burn. Of course it was crucial to shake the pan every once in a while. What can I say? The dish was simply FAB!